Published on June 8, 2009 in Homebrew. 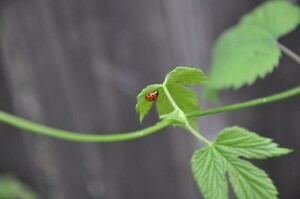 1 Comment Tags: hops, pests. My wife brought home a tub of ladybugs that I’ve placed on my two hop plants. Aphids hit them hard the last 2 weeks and the ladybugs had no reservations about taking up residence. This morning I found 10 of the lil’ bugs still hanging out on the plant, working on their quota of 50 aphids a day. I’ve also found a clutch of ladybug eggs on one of the leaves that I swear wasn’t there yesterday. Great pic. Long live the Ladybugs!